In my humble, jewel-loving opinion, September babies snagged one of the best birthstones around: the gorgeous sapphire. Sapphires come in many shades, but the beautiful traditional deep blue color is easily the most recognizable. Here are my picks for the top ten royal sapphires -- be sure to weigh in with your lists in the comments below! When Princess Caroline of Monaco attended the wedding of Crown Prince Frederik of Denmark in 2004, all eyes were on her tiara, an heirloom from the collection of her husband, the Prince of Hanover. But she also wore a set of Monegasque heirlooms that day: the cabochon sapphire and diamond demi-parure from the collection of her grandmother, Princess Charlotte. Charlotte wore the set, which was made by Cartier, at the wedding of Caroline's parents, Rainier and Grace, in 1956. Caroline has been wearing the demi-parure -- which includes a necklace, earrings, and a pair of brooches -- since the 1970s. When we explored the jewel collection of the late Diana, Princess of Wales last month, many of you were understandably drawn to the gorgeous sapphire and diamond clasp of one of her pearl choker necklaces. The clasp, originally a separate brooch, was a wedding present to Diana from the Queen Mother. Diana wore the piece during her tenure as Princess of Wales as well as after her divorce. Marie-Adélaïde of Nassau may have had a short and tumultuous tenure as Luxembourg's reigning grand duchess, but she left a gorgeous sparkling legacy in the family's vaults: a diamond and sapphire tiara. Created in the late nineteenth-century, the tiara features leaf motifs surrounding a single large sapphire. The tiara can also be worn with an aquamarine in the place of the sapphire, but for me, the darker blue stone is the star of this sparkler. On her wedding day in 1947, the future Queen Elizabeth II received a special gift from her beloved father, King George VI: a small suite of Victorian sapphire and diamond jewels. The necklace and earrings reportedly date from 1850, and the playwright Noel Coward called them "the largest sapphires [he had] ever seen." In 1963, Elizabeth acquired a necklace formerly owned by Princess Louise of Belgium, had it set on a tiara frame, and used it to round out her sapphire set. Crown Princess Mary of Denmark often wears a brooch made of diamonds, pearls, and a large faceted sapphire. It was reportedly one of the wedding gifts given to Princess Louise Margaret of Prussia when she married the Duke of Connaught (one of Queen Victoria's sons) in 1879. The brooch made its way to Denmark via Louise Margaret's granddaughter, Queen Ingrid. In 2006, Queen Margrethe gave the brooch to her daughter-in-law as a present in honor of the birth of her first child, Prince Christian. One of the oldest sets of royal sapphires in Britain is the Cambridge sapphire parure, a set of jewelry that originally belonged to the Duchess of Cambridge, a daughter-in-law of King George III. The set was eventually inherited by another member of the Cambridge family: Queen Mary. In turn, she gave the sapphires to her daughter-in-law, Princess Marina. The set originally included a tiara, a necklace, a stomacher, and a set of brooches, but Queen Mary rearranged and augmented the jewels with additional pieces. The current wearer of the set is the Duchess of Kent; while the Kents auctioned off the parure's original tiara, stomacher, and necklace, they have kept some of the pieces, including a second button-style tiara. We've talked a bit about the classic sapphire and diamond brooch from the Queen's collection -- the Prince Albert Brooch -- but for my money, the more intriguing sapphire brooch in HM's collection is the sapphire, gold, and diamond brooch with Russian imperial roots. The brooch was acquired by Queen Mary from the collection of the late Marie Feodorovna in the 1930s. Mary left the brooch to Elizabeth II in 1953, but the Queen Mum kept the piece in her jewelry box until her death. The Queen didn't wear the brooch in public for the first time until earlier this year, on a trip to Rome. One of the most glorious sapphire sets around is the diamond and sapphire parure that belonged to Queen Marie-Amélie of France. The set, which includes a tiara, a necklace, earrings, and three brooches, was privately owned by Marie-Amélie, who was the wife of King Louis Philippe I. It's been said that Marie-Amélie wasn't the first royal owner of the sapphires -- it's possible that she bought them from Hortense de Beauharnais, the daughter of Empress Josephine. The sapphires stayed in the family even after Louis Phillipe lost his throne, and the mother of the current Count of Paris wore them regularly. But her husband ended up selling the parure -- but happily, it was purchased by the Louvre Museum. The glorious sapphire tiara worn by Queen Maxima at her husband's inauguration in 2013 has a long history in the Dutch royal family. The family's sapphire set is actually a "married" parure, with different sapphire jewels paired together even though they weren't made as a matching set. The parure includes the tiara, a necklace, a set of bracelets, and a set of brooches. The Dutch royal ladies are inventive with their jewels, however, and they tend to wear parts of the parure separately and with additional sapphire and diamond pieces. One of the grandest sapphire sets in any royal collection is the sapphire and diamond parure owned by the Swedish royal family. It's possible that the set was given as a wedding present in 1806 to Princess Augusta of Bavaria by Napoleon Bonaparte, her groom's stepfather. Augusta's daughter, Josephine of Leuchtenberg, brought the set with her when she married the Swedish king, and the sapphires have been with the Swedes ever since. 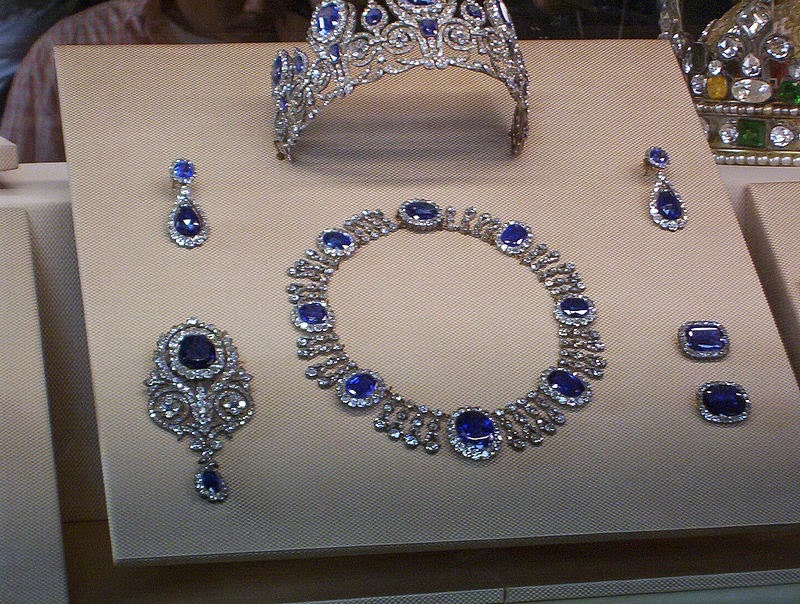 The set includes a massive diamond and sapphire tiara, a necklace, a pair of earrings, a brooch, and a set of hair ornaments.